There are many places online where the intrepid crafter can buy wholesale beads. Getting your beads, or at least some of your beads, from a wholesale bead dealer, can save you a lot of money and open you up to new possibilities you would not find in your local craft store. Wholesale beads are exactly the same beads you could buy in your local craft store or bead shop. They are the same quality and often from the same manufacturers you could find in your regular store. The difference is that instead of buying from a store, you're buying direct from the wholesaler or manufacturer. This gives you access to a wider range of beads for a lower price than you would find at your local store. Who Can Buy Wholesale Beads? Many wholesale bead suppliers are open to the public. They will allow you to buy in whatever quantity you like (unless items are packaged), but there are discounts when you buy in volume. Other shops that sell wholesale beads require a minimum purchase in order to do business with them. These minimums can range from $25 to $250, so make sure you check the order page for any policies on minimums before you start shopping. Still other shops require proof that you are actually a professional beading designer before they will sell to you. That means you either have to have a tax identification number, an employer identification number or a business registration number to prove that you are reselling the beads and not just buying them for your own personal use. These stores often have higher discounts, but are more like a real wholesale situation where you have to buy a larger quantity as well. But if you're just beading for yourself, family and friends, this won't really be an option. Where Can I Find Wholesale Beads? There are many, many wholesale bead companies out there, with a wide variety of merchandise. 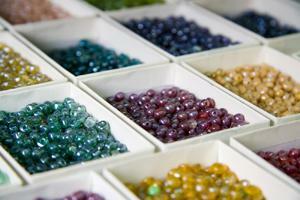 Some companies specialize in certain types of beads such as semi-precious, crystals, Bali, or other varieties. Fire Mountain Gems is the granddaddy of wholesale beads. This site has just about anything you could want for all your beading projects, including unusual items I'm sure you'll never see in your local store. No minimum order, great discounts for larger quantities, and the ability to mix and match to save money make this a must-stop shop. Arizona Bead Company has a $40 minimum order (shipping can be counted as part of the order) and a $2 handling fee. They sell a wide variety of crystal, glass, silver, bone, even magnetic beads. House of Gems has no minimum order, ships free with orders over $100, and offers a customer loyalty program. As the name implies, their specialty is gems, but they also sell silver, pearls and beading findings. Trash City is a fun site that prides itself on having unusual beads, findings, and trinkets that no self-respecting beader can live without. They have some really beautiful, and often pricey, items, but you do have to pay for the unusual. Minimum order is $25 before shipping, which shouldn't be difficult given all the fun stuff they have. Bead Peddler is a fun site because it has a great selection of lampwork beads, which are usually quite expensive. Wholesale pricing gives you a little break, and if you really want to buy in quantity you can get a 20 percent discount when you buy four lots of lampwork beads. There is no minimum, but the minimum shipping fee is $5.50, so shop accordingly. If you're looking at a company that has minimum purchase requirements, go in with a buddy or two to buy your wholesale beads. It's probably a good idea to do this even when there's not a minimum purchase required, because you'll get a price break if you and your friend both want to buy some of the same types of beads. There are whole groups on the Internet devoted to this notion of bulk buying of wholesale beads. Check out a group like Buying Beads or search for bulk bead buying on your favorite group site. The most important tip I can offer for buying wholesale beads is not to get overwhelmed. It can start to feel a bit like a kid in a candy store when you start browsing some of these websites. Resist the urge to buy everything. It helps if you have a project in mind before you go shopping so that you won't break your bank on pretty beads you have no real use for. If you must buy beads you don't have a plan for, make sure that you come up with something to do with them as soon as possible after they arrive at your house. I know from experience how procrastination can keep you from using even the most beautiful beads (I have this lovely strand of peridot chips that's been festering in a drawer for more than a year). So use your newfound cheaper source for beads as inspiration for some great new beading projects!